The plan: Find the Monkey Rock, a decent-sized piece of granite whose features resemble that of a monkey head, near Incline Village off the Flume Trail. Monkey Rock, overlooking Crystal Bay at Lake Tahoe. I remember hearing about Monkey Rock a year or two ago and a friend posted a shot on Instagram recently, which served as a bit of a reminder that I wanted to check it out. A quick search for details and/or directions wasn’t overly helpful, save for the very cool Forever Adventuring blog I came across. That got me pointed in the right direction. Today’s hiking partners were my daughters, ages 13 and 8. The weather was absolutely perfect on Sunday so we got mobilized by 9 a.m. and were out the door en route to Incline Village. Now that I’ve been there, I can tell you there are a bunch of ways to get to Monkey Rock, as it’s just off a main east Tahoe trail. 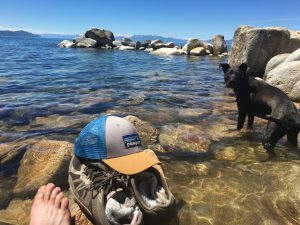 I’ll give you the easiest and shortest way, but just know there are other options, especially if coming from Marlette Lake or riding/hiking the Tahoe Flume Trail. We parked on the road next to Tunnel Creek Café, which I only know from my ride on the Flume Trail last year with my brother-in-law. I popped into the café and bought a Gatorade and asked one of the girls behind the counter about getting to the rock. Her description meshed with I’d read in the blog so off we were. The first half of this hike – my GPS had it at just over two miles roundtrip from the café; YMMV based on route – is just a flat stroll, moving gradually up the trail. Past the second forest service gate (full directions below), it becomes a hike. At the split, take the steep trail to get the heart rate going, or stay on main trail for a longer route. Either way, it’s an elevation gain of more than 400 feet for the hike. We took the steep route on the way up. We reached Monkey Reach just behind a couple that was simply looking for a nice lake view. 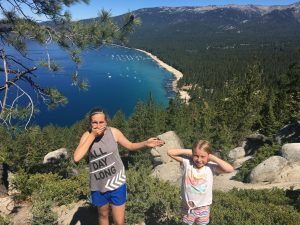 And the views of Tahoe are gorgeous from the point, which explains why they didn’t even notice Monkey Rock until my girls were hamming it up in front of it. Moose was too distracted by a squirrels and a lizard to pay any mind to Monkey Rock. The girls and I took a few photos, including a “Three Wise Monkeys” shot of which we were quite proud. Moving back down towards the café, we took the main trail, if only because the steep path had enough loose dirt and the girls were just everyday Nikes and a slip was more probable than not. After a quick restroom stop at the café, we jumped in the car and popped over in time – still before noon at this point – to get a good parking spot about a quarter mile from Hidden Beach. The beach is “hidden if only because you’ll drive right past it on Highway 28 without knowing it’s there. But the dozens of cars parked on the side of the road just north of the beach will tell you that it’s a known commodity. We had packed a lunch and the girls braved the still-cool waters for a swim, something that gave Moose much anxiety. He whined, whimpered and barked with each foot they got from shore, in part because they were moving away from him and in part because there were a couple other dogs around and off leash and I think he was being protective. I like that he’s protective of the girls, but I also want him to settle down a bit to the point where I trust him to hang with us off leash. We later got him in the lake for the first real swim of his 21 months on this planet. All in all, a pretty perfect day. Directions: Follow the paved road alongside Tunnel Creek Café. You’ll walk past approximately 2,856 “No Parking” signs and then hit a forest service gateway where the paved roads turns to dirt. Lake views hit you immediately off to your right and you likely won’t be alone on the path. A little more than a half-mile up and you’ll hit another forest service gate. Just beyond that, you’ll notice a steep trail shooting off to the left and up the hill. That’s the shorter, steeper route. If you stay on the main trail, it takes a gentler grade and the trails meet again about a quarter-mile up the main trail. At that junction, look up to your left, toward the lake and you’ll see a narrow trail heading that way. Monkey Rock is a short jaunt up that trail. Along the way to the junction from the café, you’ll see a cut-off down to Hidden Beach. I’ve not taken that but we did visit the beach later on. 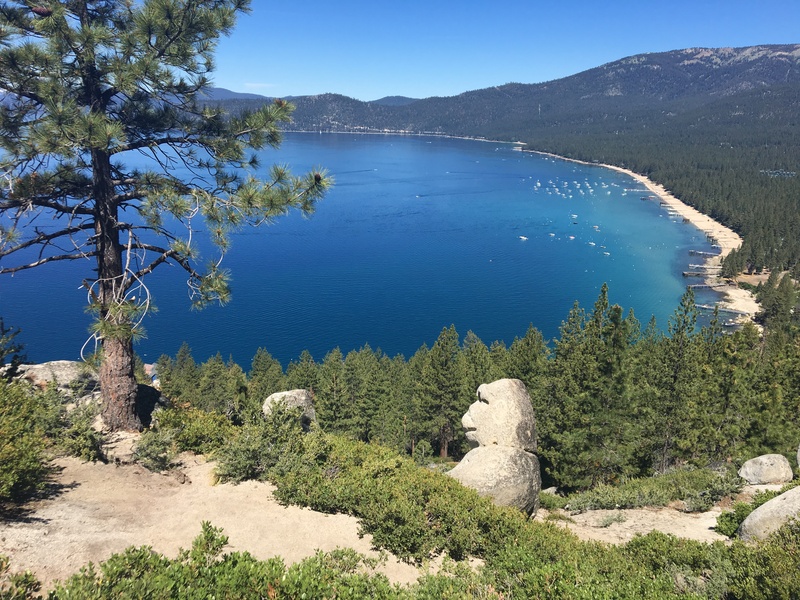 If you keep going on the main trail, you’ll eventually hit Marlette Lake and Spooner Lake and can also connect with the Tahoe Rim Trail. Gear: Nothing special today. Wore my Columbia low-tops and an old backpack to carry some water and a dish for Moose. Per usual, I forgot my walking sticks. Post-hike beer: No beer consumed. Rather, a quick homebrew session when I got home as I brewed a single-hop pale ale try the new “Idaho 007”/”Golden Hop” that a lot of brewers have been talking about. Should be ready to go by the end of July or early August. I’m so happy that my blog was helpful in finding Monkey Rock! Cheers and happy hiking! !